Have a Nice Manga Vacation! This week, we're offering Fairy Tail, Parasyte, and other classic Kodansha Comics digital volume 1s for only 99 cents! But hurry! This offer lasts December 27 through January 3 at all of our digital retail partners: BookWalker, comiXology, iBooks, Kindle, Kobo, and nook. Where do you want to go for your manga vacation? Naoshi Arakawa was the Guest of Honor at Anime Expo 2016 in Los Angeles. 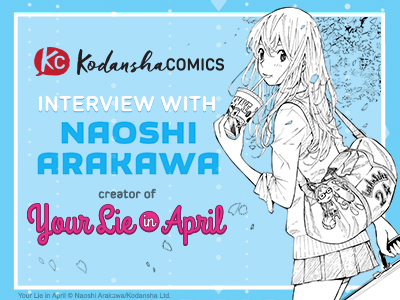 And while Arakawa’s best known work Your Lie in April has gained recognition from the popularity of his manga and its anime adaptation, there’s not much public information about the man himself. But during a rare Stateside appearance, Arakawa spoke candidly about himself in front of a large audience there for his highlight panel, hosted by Kodansha Comics. 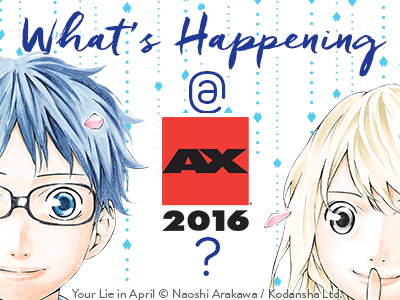 What’s happening @ Anime Expo 2016? Going to Anime Expo this year? If you’re there, be sure to catch all things Kodansha Comics!